It's an 8 foot wasp! Thank goodness it doesn't have wings. But then... how did it get up the tree? HOW DID IT GET UP THE TREE?! OK, fine. It's a snake. And that means it got up the tree by climbing it, all preternatural like. Snakes don't need legs or hands or claws or any of the other things you need for climbing. Snakes don't need anything. They're basically magic. 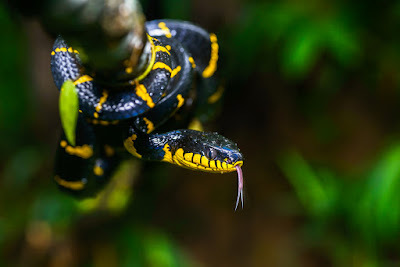 This particular magician is the Mangrove Cat Snake, also known, for obvious reasons, as the Gold-ringed Cat Snake. 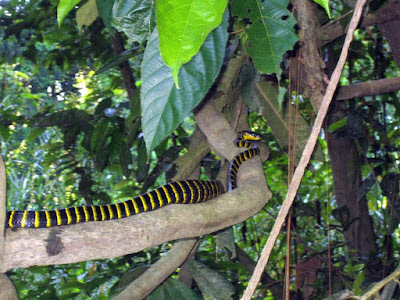 They can get quite large, reaching some 1.5 to 2.5 metres (5 to 8 feet) long, and are found in mangroves and rainforests from India to Thailand and the Philippines. Mangrove Cat Snakes spend the day resting in trees near to water, sometimes coiling up on a branch directly over a river. Which sounds amazingly peaceful and must do wonders for their mood, right? No? No. They wake up at night to feed, and when it comes to midnight snacks, they like to keep their options open. They can forage in the trees, seeking out birds and their eggs. They can descend to the forest floor and search for rodents. They can slither along the riverbanks on the lookout for frogs. And if the pickings are slim, they can swim to the other side of the river and investigate pastures new. And all the while their only legs are the ones disappearing into their gullet. Magic, I tells ya. 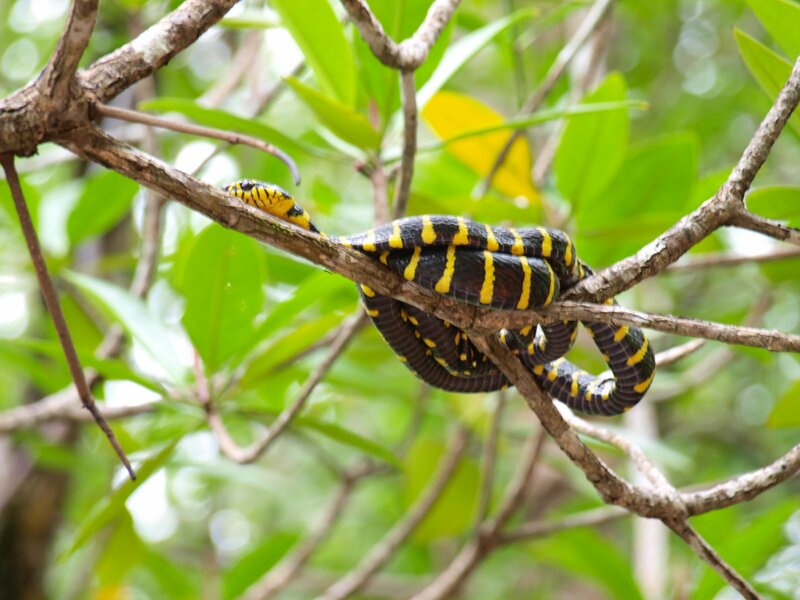 Mangrove Cat Snakes are only mildly venomous and don't seem to be particularly dangerous to humans. A bite will still hurt, though! And these snakes are noted for being cranky, temperamental and easily annoyed. Then again, it does look like an enormous wasp. You can't say you weren't warned. 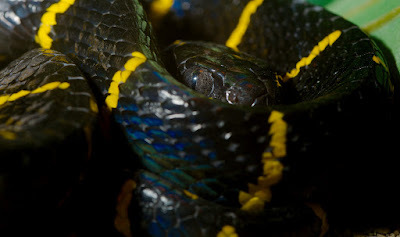 That is one scary looking snake, although beautiful in color and design but frightening. Thanks for the info about it, now I know what to avoid to stay away from the snake haha. 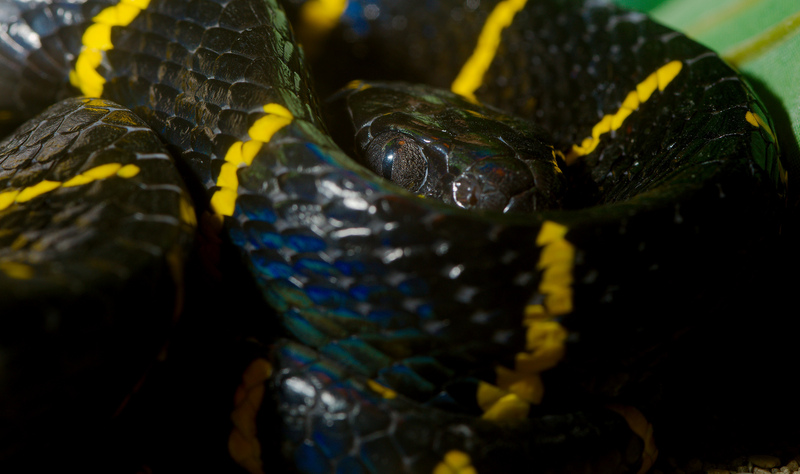 Snakes are really good at looking scary and beautiful at the same time!